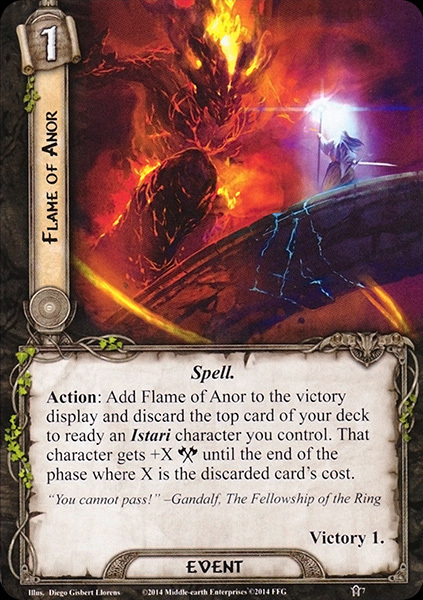 One of the distinctive features of the LOTR LCG community has been that we often give as much attention to bad cards as we do to the good ones. Some of the worst get even more. It is like a hobby within the hobby to fixate on a few awful cards until they become an inside joke that only diehard fans of the game can appreciate. Any mention of the Mirkwood Pioneer will undoubtedly garner a few chuckles from the Grey Company Podcast while a well-timed reference to “KET” can still bring down the house on Cardboard of the Rings. 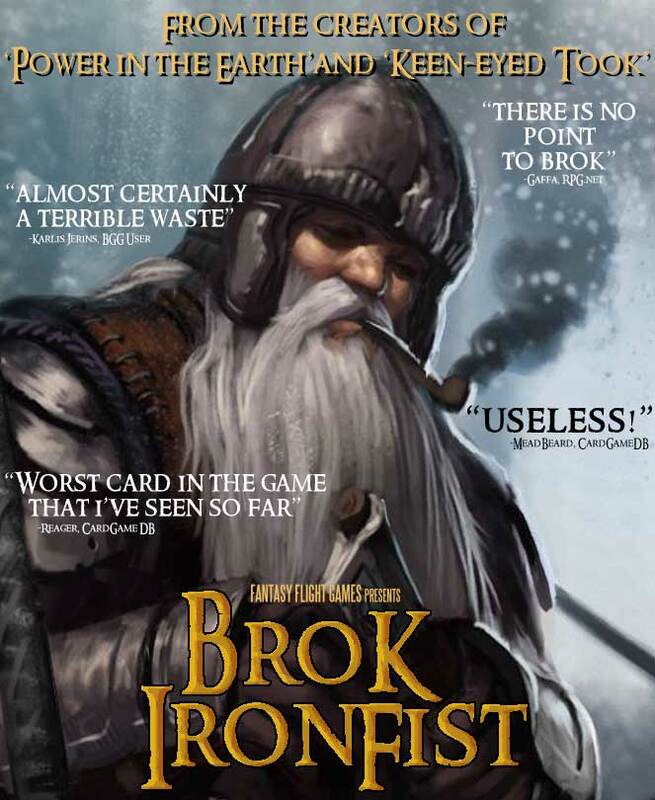 It is in that cheerful spirit of supreme mediocrity that I would like to submit my own humble nomination to LOTR LCG League of Lackluster Legends — Brok Ironfist. Like the other cards in this club, it is not simply the fact that Brok is practically unplayable that makes him special. There are plenty of cards to fit that bill. What elevates Brok above the rest is that he has been so bad for so long that it has almost become endearing. My mock poster for the Brok Ironfist spin-off movie is just a small sampling of actual comments made about him in the forums over the past four years. The clinching reason for my sudden interest in this disused dwarf at Master of Lore however is not just because it’s funny how bad he is. It is because I recently made an interesting discovery while flipping through the pages of The Peoples of Middle-earth. It turns out that our beloved below average ally is not as much of an FFG creation as I originally assumed. Yes, ladies and gentlemen, you heard that right. With just a little bit of imagination, Brok Ironfist actually has something of a canonical place in Tolkien’s world and <gasp> he is actually a pretty cool unique character. Join us as we explore his legend, showcase the artwork, and discuss the most overcosted card ever created for our game! Click for a high resolution scan of this entry’s featured card. My deprecating amusement with Brok Ironfist began the first time I opened the core set. After shuffling through the heroes and finding the likes of Beravor, Eleanor, and Thalin, I realized that our game designers were going to be introducing some of their own original characters to Middle-earth. Initially I assumed that the name ‘Brok Ironfist’ was a cheap knock-off of Dáin Ironfoot, in the same way Thalin appeared to be a poor man’s Balin or Dwalin. Clearly, someone clever just switched the body part combined with ‘Iron-‘ and grabbed a random first name from the guy named Brock in the next cubicle (dropping the ‘c’ to make it look more Tolkieny). Ta-da! Brok Ironfist. Not so. To begin with, the name Brok wasn’t just pulled out of a hat of random names. Like many of the names Tolkien gave to his Dwarves, it appears to have been carefully chosen from ancient Norse mythology. 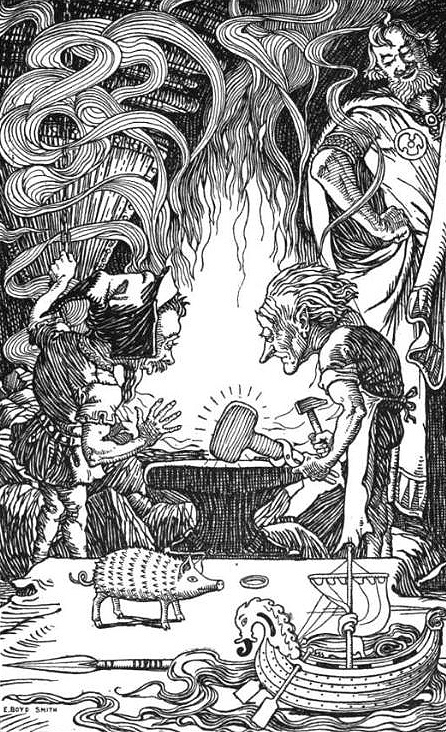 In the Poetic Edda, the same tale from which Tolkien lifted the Dwarf names Gimli, Glóin and others, we learn of two dwarves named Sindri and Brok. These brothers were famous craftsmen who made a number of magical artifacts for the gods including but not limited to Thor’s hammer and Odin’s magical ring. Far from being a knock-off, the name Brok now seems like a wonderfully thematic choice for a new character named Ironfist in Tolkien’s world! In fact, this isn’t the first time that a Lord of the Rings card game designer has pulled a new Dwarven name out of one of Tolkien’s favorite myths. 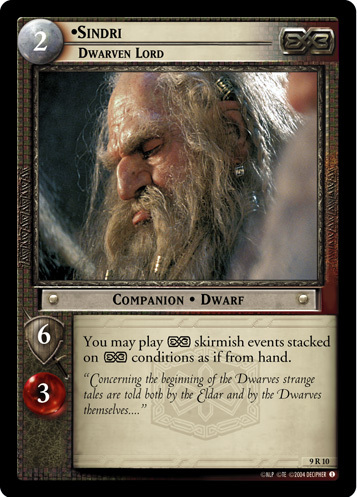 Decipher’s LOTR TCG named one of their Dwarf-lords from Peter Jackson’s films Sindri, printing a rare companion card for him in their Reflections set. There are over 100 Dwarf names cataloged in the Völuspá and so the well of inspiration is deep should the designers ever choose to create another new Dwarf for us. Will we be seeing new Dwarf allies named Austri and Vestri or Skirfir and Virfir coming in the future? Only time will tell! Now that we see where Brok came from, what about Ironfist? Surely that is a bootlegged version of King Dáin’s designation. Not even close. 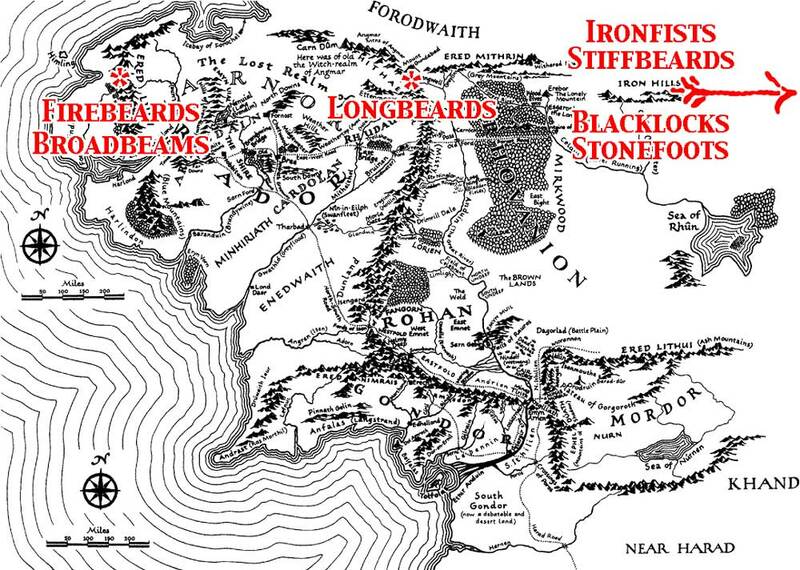 As it turns out, the name ‘Ironfist’ is lifted straight from the pages of Tolkien’s writings. In the 12-volume History of Middle-earth series, Christopher Tolkien attempts to chart the creative development of his father’s legendarium through an extensive collection of the Professor’s notes and writings. 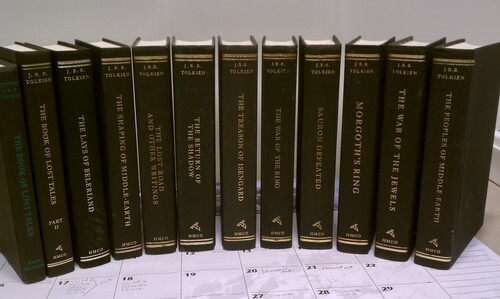 The series spans from The Book of Lost Tales (early writings from the 1910s) to The Peoples of Middle-earth (late writings of the 1960s, including the first pages of an abandoned sequel to Lord of the Rings). It is in this last book, finally published in 1996, that we get an essay titled “Of Dwarves and Men”, a rambling ‘historical-philological essay’ inspired by ‘consideration of the Book of Mazarbul‘. Here Tolkien names for the first time the ‘other six kindreds of the Dwarves’ in a passage about the awakening of the Seven Fathers in the early dawns of Time. Durin is the name that the Dwarves used for the eldest of the Seven Fathers of their race, and the ancestor of all the kings of the Longbeards. 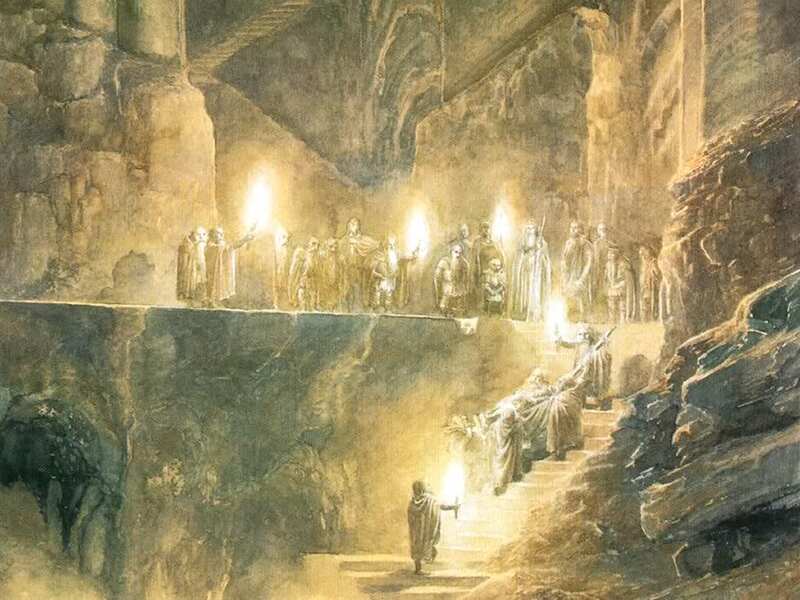 He slept alone, until in the deeps of time and the awakening of that people he came to Azanulbizar, and in the caves above Kheled-zâram in the east of the Misty Mountains he made his dwelling, where afterwards were the Mines of Moria renowned in song. 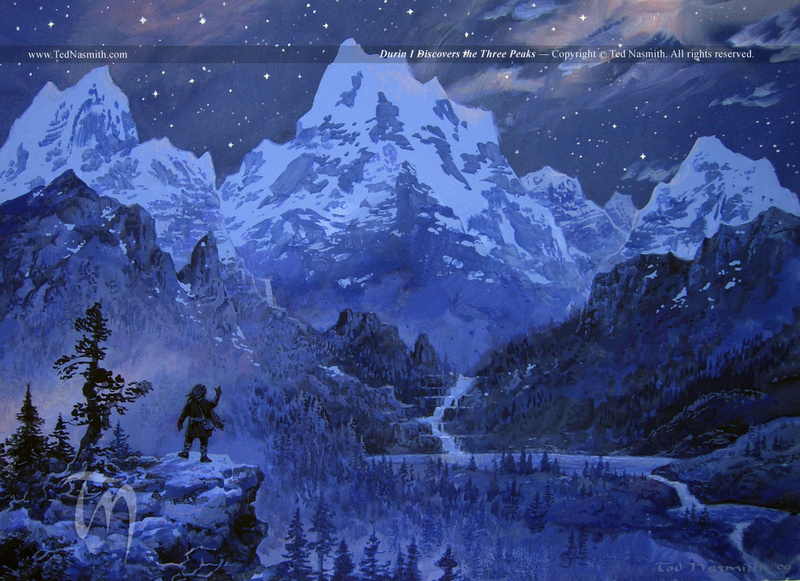 The site of Durin’s solo awakening was Mount Gundabad, in the northern ranges of the Misty Mountains. The other six ancestors came in pairs. The Firebeards and Broadbeams were ‘the most westerly’, awakening in the Blue Mountains. The other two pairs ‘were eastward, at distances as great or greater than the distance between the Blue Mountains and Gundabad’. One pair was named Blacklocks and Stonefoots while the final pair was the Stiffbeards and, wait for it, the Ironfists! As I said before, this is the only instance in the entirety of Tolkien’s legendarium that the Ironfists are mentioned and their name is given literally one time. Still, this is enough for us to give massive kudos to our game designers for their obscure reference and to begin piecing together clues for a sort of fan fiction story about our boy Brok. First, and most obviously, Brok is not a member of Durin’s folk, the most populous and powerful House of Dwarves, the Longbeards. Tolkien has previously introduced us to other non-Longbeard Dwarves in his stories though. Turning back to Appendix A, we learn that Bifur, Bofur, and Bombur of Thorin’s companions were also ‘not of Durin’s line’ (all the others were). 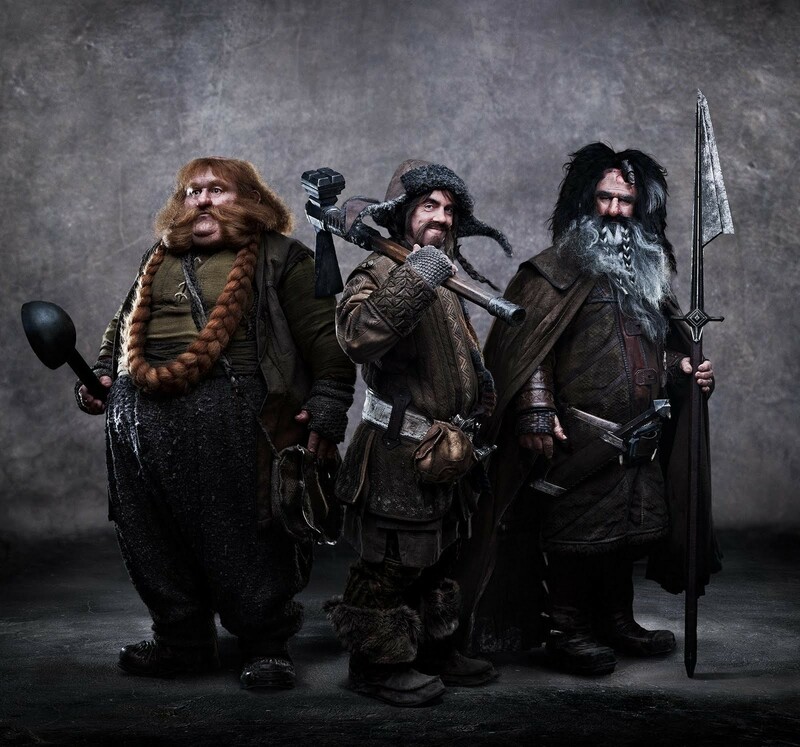 That said, it seems more likely that this trio from The Hobbit were Firebeards or Broadbeams since their ancestors at least hailed from the same part of the continent as Durin’s folk. Bombur Firebeard? Bofur and Bifur Broadbeam? In times of great need even the most distant would send help to any of their people, as was the case in the great War against the Orks [sic] (Third Age 2793 to 2799). We might imagine that when the message finally arrived in the Far East, Brok was chosen to represent the Ironfists in the battle. Given what we learned of Brok’s namesake in the Poetic Edda, perhaps we can picture him as a metalworker or weaponsmith in service to the king of the Ironfists. He may have traveled at least a year’s journey westward to join ‘this war for vengeance’ and draw arms beside ‘the great forces sent from the Houses of other Fathers’. Maybe there were only a few ambassadors from his land and so Brok took the name of his own people as an appellation. The War of the Dwarves and Orcs culminated in the Battle of Azanulbizar, fought in the Dimrill Dale before the east gate of Moria. 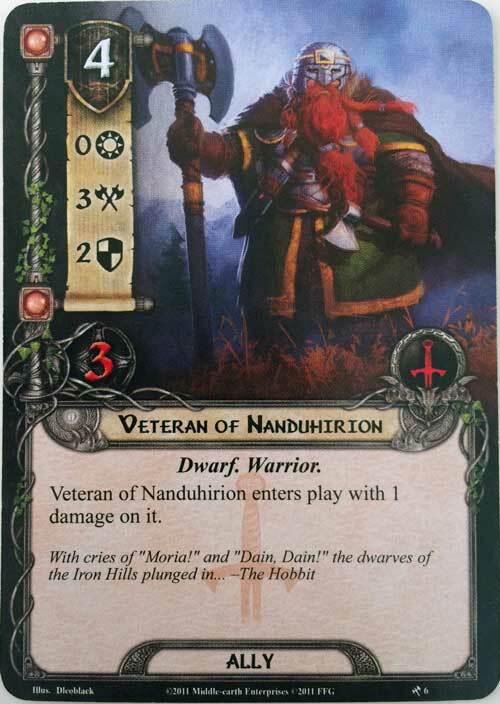 Known to the Elves as Nanduhirion, this battle lends its name to another underused and overcosted Dwarf ally in our beloved card game. But one residual wound token is hardly enough to mark its pain, the memory of which still causes the Orcs to ‘shudder and the Dwarves weep’. In this battle, Brok Ironfist would have fought beside King Thráin and his son Thorin Oakenshield while their brothers fell around them ‘beyond the count of grief’. Yet in the end, the Dwarves did prevail. Azog was killed by the young ‘stripling’ Dáin Ironfoot, who ‘hewed off his head’ with a ‘red axe’, sending the Orcs retreating back into Moria. The Battle of Azanulbizar (T.A. 2799) in which Azog was killed by Dáin Ironfoot. Literally ‘man-gold’, a weregild was meant to keep blood feuds from getting out of hand. 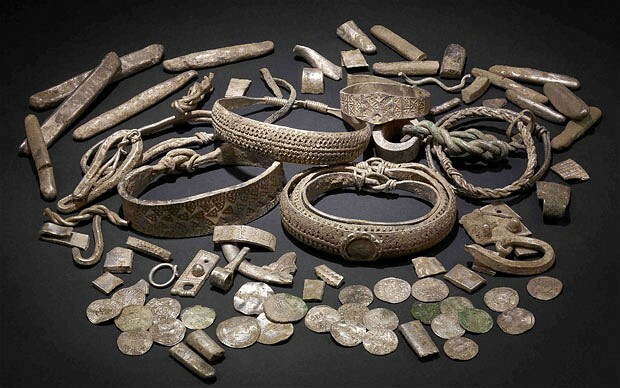 ‘Weregild’ is an archaic word that Tolkien uses frequently in his works referring to an early Germanic legal mechanism by which a person is owed a ‘man price’ when a family member is injured or killed. Isildur had claimed the One Ring as a ‘weregild for [his] father’s death’. Now remember that Brok had a brother named Sindri in the Poetic Edda. What if Brok’s brother had travelled with him into battle and now lay slain among the corpses, with no one to pay restitution for his loss. Those who fell in Azanulbizar were honoured in memory, and to this day a Dwarf will say proudly of one his sires: ‘he was a burned Dwarf’, and that is enough. After the funeral pyres cooled to ashes, ‘the allies went away to their own countries and Dáin Ironfoot led his father’s people back to the Iron Hills.’ Presumably, this is where Brok would have taken his leave. The road home is long and lonely without his brother for company or a weregild for his loss. Brok smokes his pipe and ponders the day when he will be summoned again to fight for his people. After all, ‘there is no knowing what a dwarf will not dare and do for revenge or the recovery of his own’. His metal-clad hands are empty of treasure, but Brok’s heart is full with the memory of his people, the Ironfists. Not a bad story for such a bad card, huh? The portrait of Brok Ironfist was created by Even Mehl Amundsen. He has only five cards in the entire game to his credit, though he has a diverse gallery of fantasy illustrations in his DeviantArt gallery, including this evocative scene of Smaug and Bilbo in the treasure room of Erebor. 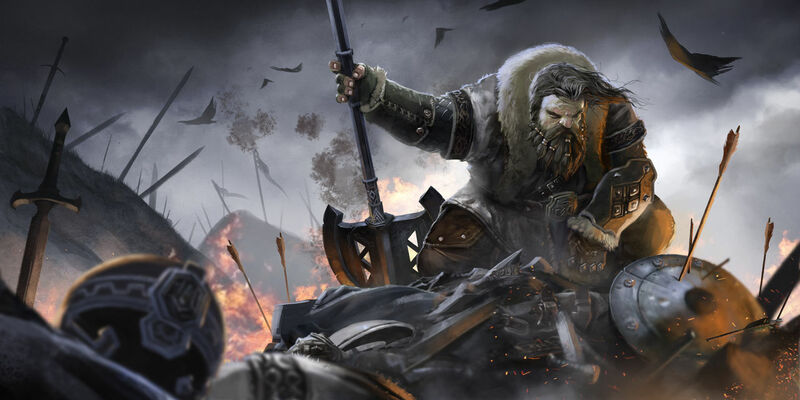 It seems appropriate that a Norwegian artist has provided the image for a Dwarf whose name was pulled from Scandinavian legend and I hope that we see more from Mr. Amundsen in the future. 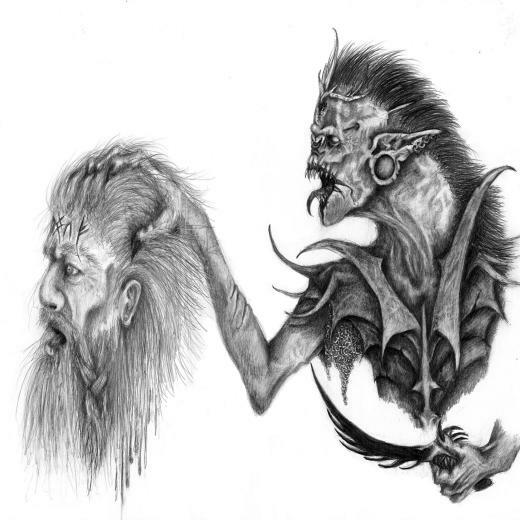 Here is an illustration of a ‘Dwarf warrior’ that he created ‘after having watched The Hobbit for the 6th time’. I am going to imagine that he is Sindri Ironfist, Brok’s fallen brother from my proposed backstory. This would make great art for an custom FFG card, don’t you think? The second piece that I’d like to feature is from veteran Tolkien artist Ted Nasmith. We’ve enjoyed dozens of his works so far at Master of Lore and there are still many, many more to go. Mr. Nasmith’s sister first introduced him to The Lord of the Rings when he was a high school junior in the early 1970s and it quickly became ‘an urgent and deeply satisfying new focus’ in his life. 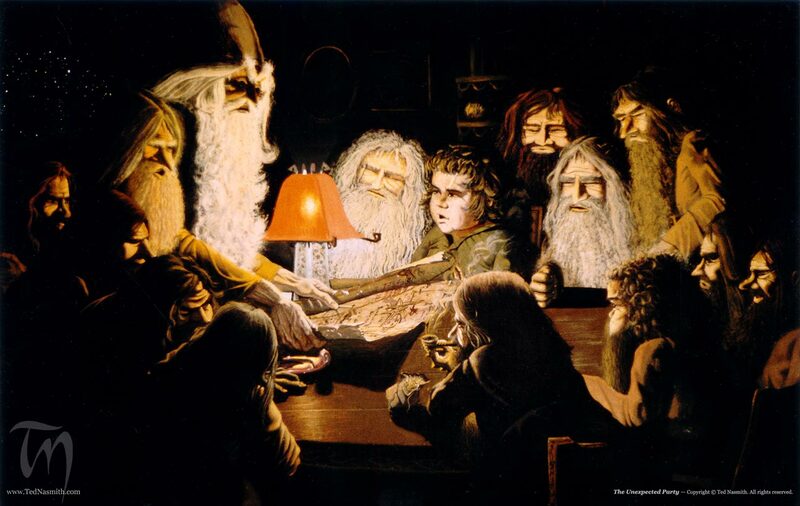 As a teenager, Nasmith painted “The Unexpected Party” from The Hobbit and proudly sent a photograph of his work to J.R.R. Tolkien himself. In his typical fashion, the Professor responded a few weeks later with a letter. He complimented young Ted’s work while suggesting he had made Bilbo look ‘too childlike’. 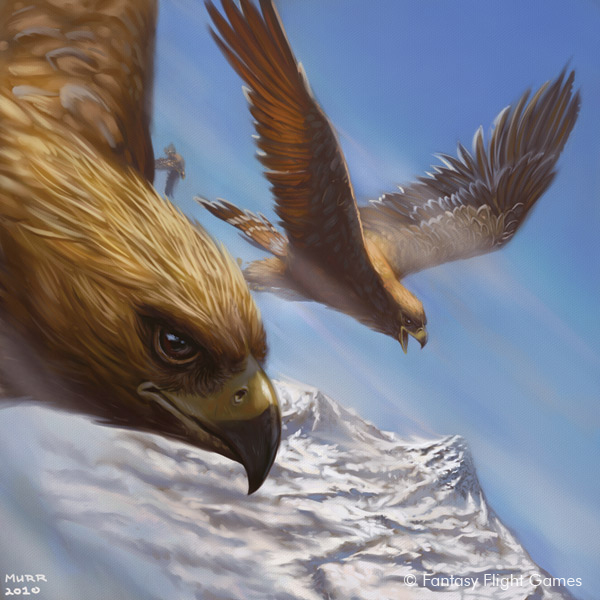 Nasmith took the criticism to heart and continued to refine the style of his Tolkien artwork, submitting pieces for consideration until he finally got his big break and was published in the 1987 Tolkien Calendar. Since then, he has been commissioned for illustrated versions of The Hobbit, The Lord of the Rings, and The Silmarillion as well as many more Tolkien Calendars. Although he was unable to accept Peter Jackson’s invitation to join Alan Lee and John Howe as a concept artist for the Middle-earth films, Ted Nasmith’s work has become just as iconic in defining the look of Middle-earth. 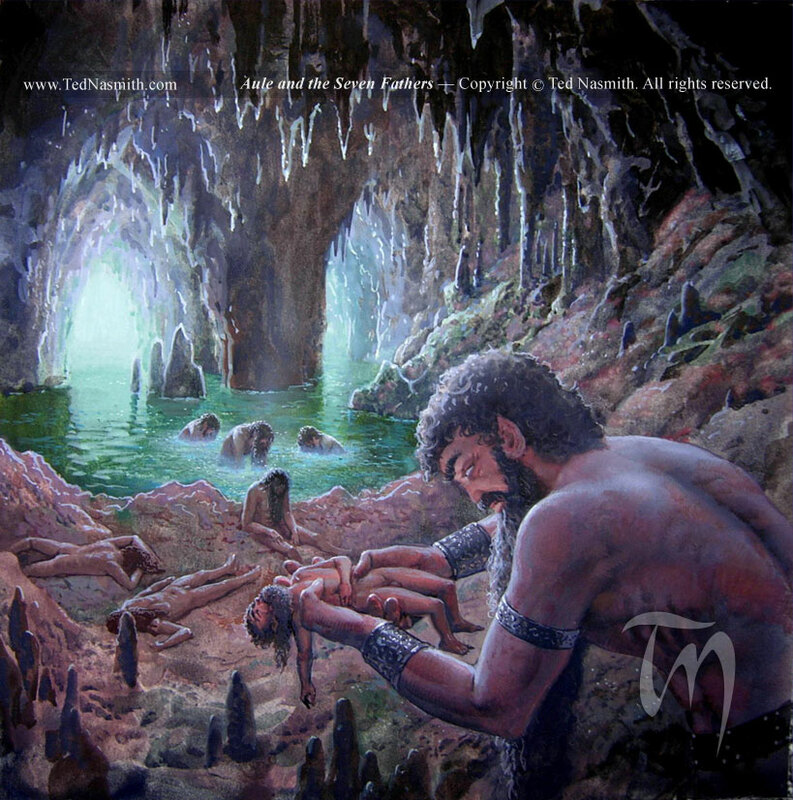 Mr. Nasmith’s piece below is titled “Aulë and the Seven Fathers” depicting the scene from The Silmarillion when Aulë, master craftsman of the Valar, creates the Dwarves in his impatience waiting for the Elves and Men to awaken. He is caught in the act and lifts a great hammer to ‘destroy the work of [his] presumptions’ but Ilúvatar intervenes, giving grace for Aulë’s humility and sparing the Dwarves. They are not, however, allowed to come before the Ilúvatar’s Firstborn, the Elves. 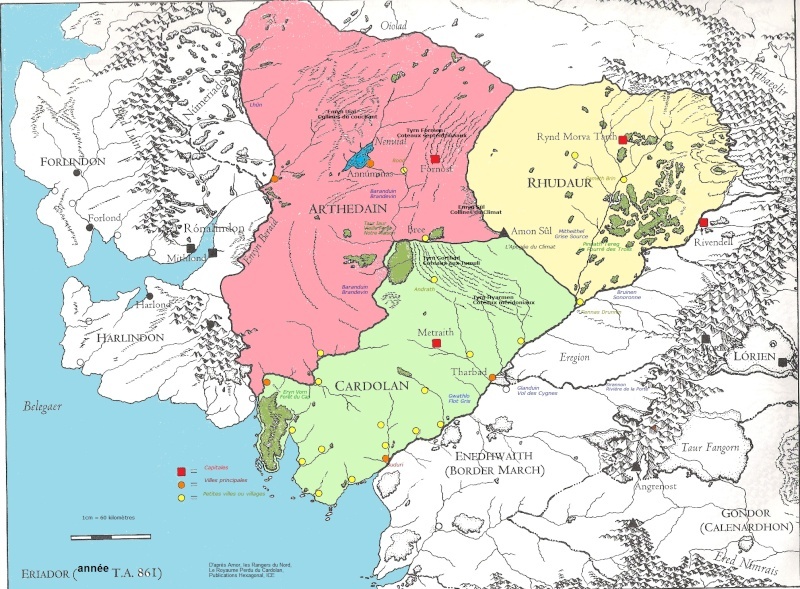 Therefore Aulë takes ‘the Seven Fathers of the Dwarves, and [lay] them to rest in far-sundered places’ where they slept ‘in darkness under stone’ until the day of their awakening. The Seven Fathers are indistinguishable in Nasmith’s artwork, but one of them is the original Ironfist, proud ancestor of our expensive Dwarf ally! Our final depiction of the Ironfists comes from Italian artist Lucrezia aka LadyNorthStar. Her artwork of the ‘far-sundered’ Houses of the Dwarves goes a direction that few have undertaken in their adaptations of Tolkien’s mythology. She introduces some racial diversity within the peoples of Middle-earth, portraying the Dwarves of the distant East with darker skin tones. 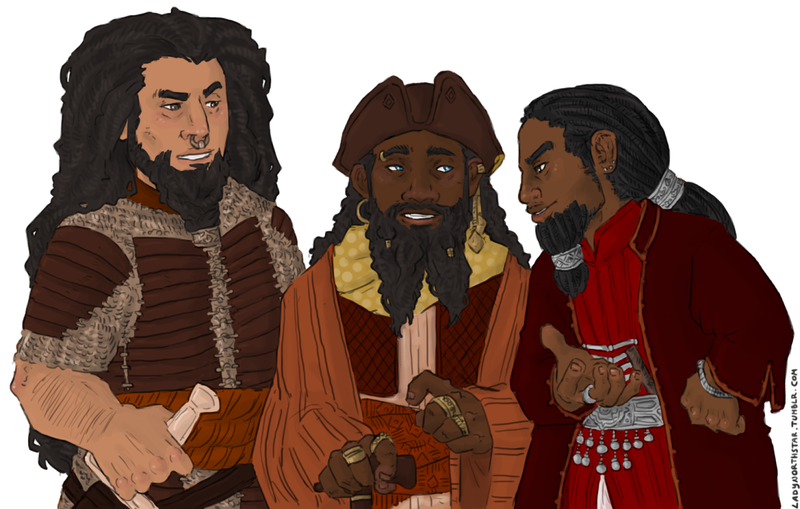 I am personally fascinated by the idea of the Far Eastern Dwarves like Brok Ironfist appearing non-White (though their decidedly Anglo-Saxon names suggest otherwise). One of my long-standing hopes is to see a future adaptation of The Lord of the Rings that seeks not only to translate, but to transform all of the cultures, names, etymology, geography, and history of Middle-earth into an Afro-centric or Asia-centric story and language. 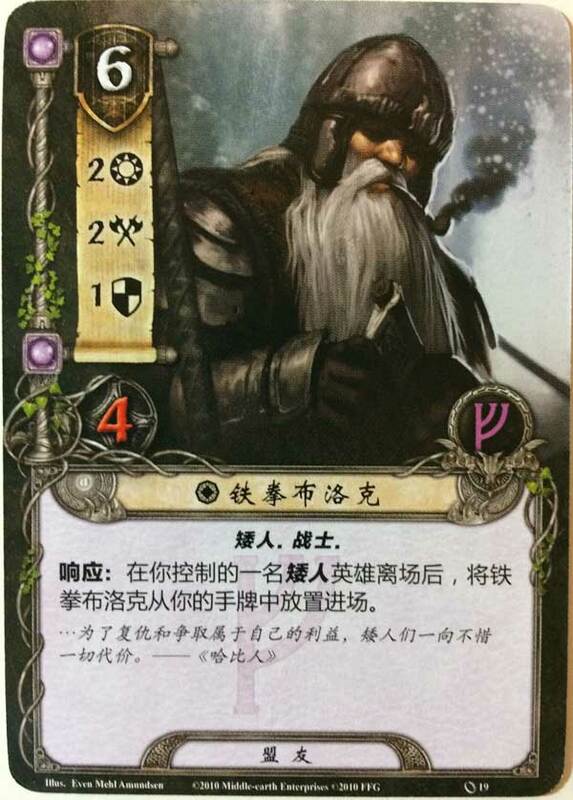 In my simplified Chinese version of the LOTR LCG, our Dwarven ally is named 铁拳 (pronounced Tie-quan) for Ironfist! Well, I’ve done my best to rehabilitate Brok Ironfist with a stirring backstory and evocative artwork. But when it comes down to gameplay, can we do the same? First of all, let’s talk theme. Utility aside, Brok’s cost and ability are actually wonderful thematic fits given the lore of the Ironfists and the legendary Battle of Azanulbizar. Because Brok hails from such a distant land, it takes an understandably unreasonable amount of resources to enlist him into the company under normal circumstances. But when news arrived that Thrór had been slain, the Ironfists came into play straightaway. If a hero falls, Brok will be there. Granted it still took three years to muster the Dwarf army in the novel, but thematically the basic premise behind Brok’s ability is pretty awesome. That said, if the Brok Ironfist card is to have any strategic utility at all, it needs to be stated outright that you should never, ever pay 6 resources for this guy. Ian has humorously conveyed this sentiment in one of his “16 Steps to LOTR LCG Addiction” over at Tales From the Cards. While Brok’s stats are on par with a hero (identical to Glóin from the core set), your resources will always be better spent bringing multiple allies into play than expending them all to bring Brok lumbering in from far-flung lands located off the eastern side of the map. Of course, Brok’s ability suggests that the game designers never really intended players to pay for this ‘great and hardy traveller’. He is meant to be a safety valve in case you lose a Dwarf hero. Even then, however, dedicating a card slot in your deck to a safety valve is rarely the best strategy. Returning to the lore for a moment, it was nice that the Ironfists and other Houses were able to rally to vengeance after Thrór was slain. But be that as it may, the better strategy for the Dwarves would have been not to let Thrór die in the first place (he actually wandered into Moria all by himself which is why Azog was so easily able to decapitate and defile him). Likewise, proactive strategies such as shadow cancellation, buffing effects, or extra allies on the table before disaster strikes are all better uses of deck space than Brok Ironfist. So are the critics right? Is Brok a pointless, useless, terrible waste that should be jettisoned back into the far East and never spoken of again? Not quite. The exact feature of his card that makes paying for him so ludicrous — those 6 resources — makes Brok an intriguing character to play in combinations that key on printed cost. So far, only one other card, Beorn from the core set, boasts such a steep price. If you can somehow cheat Brok into play with Sneak Attack or Vilya, then he could be quite helpful in telling A Very Good Tale to bring more allies into play. But where Brok can really shine, both thematically and strategically, is in completing the victory that the Dwarves left unfinished in the Battle of Azanulbizar, entering Moria and defeating Durin’s Bane. There are two quests in which this is possible — “Shadow and Flame” of the Dwarrowdelf cycle and “Journey in the Dark” from The Road Darkens. Discarding at least one Brok Ironfist in your attempt to send Durin’s Bane back to the shadow would go further than any other Dwarf in the game to fulfilling the dream Thrór was seeking to realize with his foolhardy entrance into Moria back in 2790. Brok can help break Durin’s Bane! Beyond the shadow it waits for you still: Durin’s Bane. The world must change and some other power than ours must come before Durin’s Folk walk again in Moria. 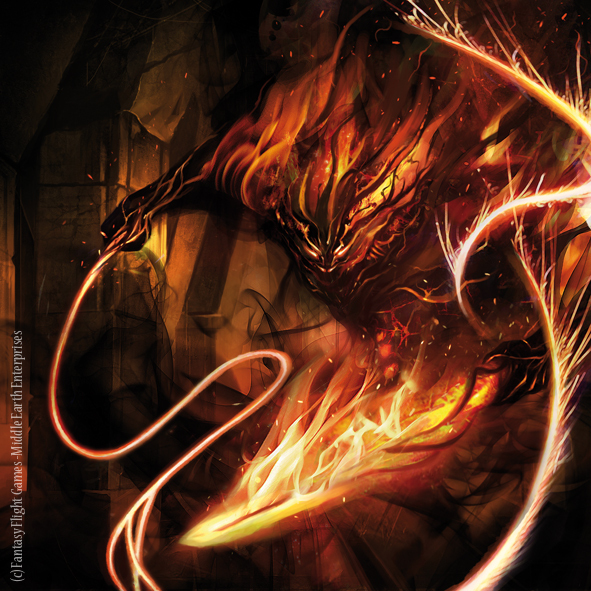 Action: Add Flame of Anor to the victory display and discard the top card of your deck to ready an Istari character you control. That character gets +X until the end of the phase where X is the discarded card’s cost. Here a well-placed Brok Ironfist could buff Gandalf by 6, once again making Brok the most powerful piece available to accomplish this potent attack. Just make sure that Gandalf has a smoke on his Wizard Pipe to put Brok on top of the deck before wielding the Flame and everything will be set! I used this combo to great effect several times in my “Wielders of the Three” deck and it was great fun to see Brok Ironfist on the table! Things can get crazy when Gandalf and Brok smoke and play with fire. Granted these are corner cases and the sweeping verdicts of Brok’s uselessness are still mostly justified. But as long as new cards keep coming which key on the printed cost, Brok may yet journey again from the far Easts of player card binders to a gaming table near you. In the meantime, he will only be in fun decks looking to try out underplayed cards. Even now an idea is forming in my mind to build an “All Overcosted Deck” with Brok Ironfist, Veteran of Nanduhirion, Beorning Beekeeper, the Dúnedain Wanderer and Radagast. Hey, Radagast is even an Istari so the Flame of Anor combo would still work. Now I just need an overcosted way to scry the player deck to make sure that Brok is on the top… I know! KET! I too have been toying with a “Wielders of the Three” deck with Brok Ironfist. The option of using him to pump up Gandalf is there, but more often I end up slapping him into play via Vilya. He’s not as cool to have on the table as Beorn, but he’s not exactly nothing either. Thanks Thaddeus, your review would be great for another mock spin-off poster. Brok Ironfist — “Not as cool as Beorn, but not exactly nothing!” I’m glad you enjoyed the article! Just discovered your site and enjoyed this article! I’m new to the game, though about 50 plays in, and wasn’t sure how to use Brok. Some great ideas! I’ve been playing Massing at Osgiliath a lot lately (finally won tonight after a dozen or so losses! ), and when a Ranger of Ithilien is not revealed in time, you end up having to sacrifice a hero to commit a character to questing so you can move onto the final stage. (In one play through, right before facing this tough choice of moving on without a Ranger, I used a card to deal two damage after declaring a defender, which killed my enemy…and discovering the Ranger was the enemy’s now useless shadow card. Ouch.) I wonder if Brok can be used in that situation, to fill in the void and assist with the final push. Perhaps not, but just curious! Thanks for the great blog! I look forward to reading more! Hello Stellar, welcome to the LOTR LCG game and your online community. You are in for a real treat! Yes, absolutely Brok can be used if you have to discard a Dwarf hero at Massing. While I wouldn’t recommend including him as a safety valve, if you know that a hero is going to die (Journey in the Dark comes to mind), then including him in the deck to push you through would definitely work. You found another use for our useless friend! Master of Lore – between this blog and Tales from the Cards, I wonder if I’ll be able to resist buying everything for this game. 🙂 Thanks again for such a cool resource that adds so much theme to the game! During the AtS cycle, during the height of the Dwarf deck monopoly on the game, my friend was playing a greedy dwarf leadership deck. You know, the kind with Thorin and Steward of Gondor with Errand Riders and Parting Gifts being suspiciously absent. During the height of his wealth and greed he played Brok at full cost! We all had a good chuckle and its one of my better memories of the game. I payed full cost for Brok at least once or twice back in the core set days. Gloin and Steward of Gondor could amount to loads of Leadership Resources with precious little to spend them on. Awesome article that I just got a chance to read! I absolutely love the mock poster and the lore behind Brok is fascinating. I actually thought the same thing when I got into the game, that Brok was purely made up, but then I also ran across the obscure mention of the names of the other Dwarf clans. But you took all this material to its logical conclusion. 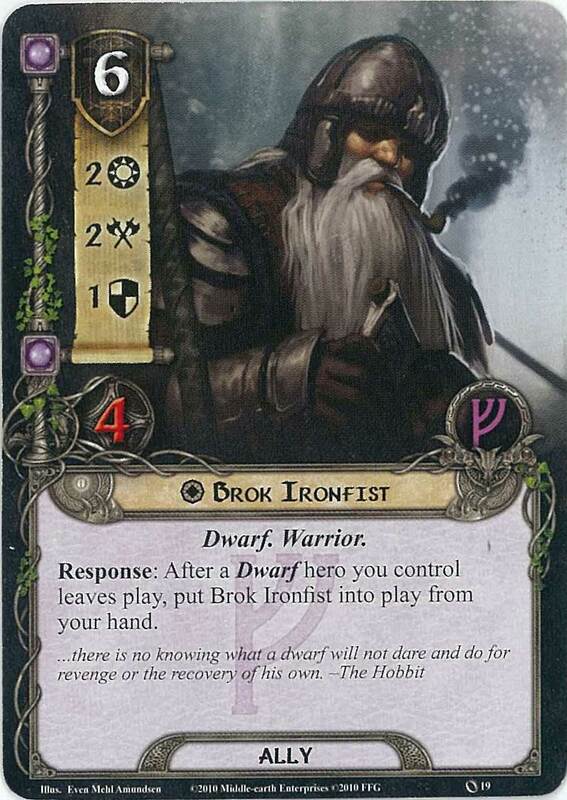 Me and my brother have both occasionally included Brok in Dwarf decks simply because there are only so many Leadership Dwarf allies, and between some set of Steward/Thorin/Gloin/We Are Not Idle+Lure of Moria/Resourceful when playing Shadow and Flame etc you can get the resources to pay for him. Plus he’s closer to being worth the cost if Dain is on the table. 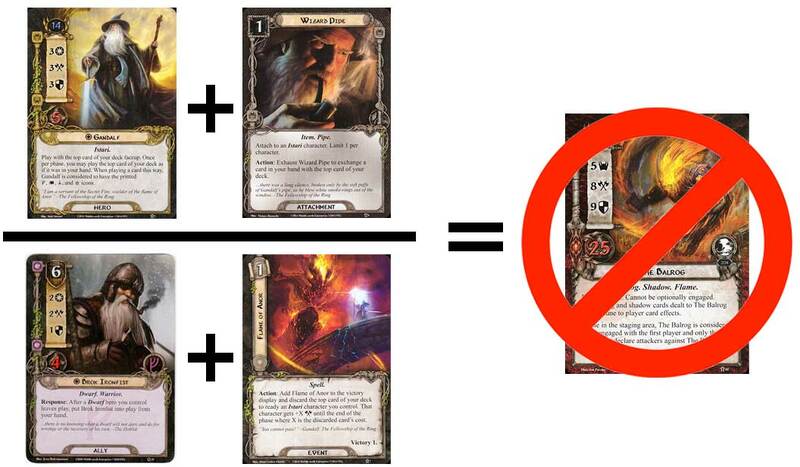 For a real challenge though, at some point (Possibly for the Line Unbroken once I reach the Ring-maker cycle) I have every intention of building a deck using at least two cards generally decried as useless, by attaching Fall of Gil-Galad to Gimli, then letting him die to lower my threat by 11 and put Brok into play for free (And hopefully then return Gimli to play by returning Landroval to my hand). Where did you get the image to the magazine cover ? I loved the blog. I emailed the artist and he sent me a high resolution version of the piece. Thanks for reading and I’m glad you’re enjoying it!